Side view of woman doing half bridge pose in fitness studio practices piltes or yoga warming up exercises for spine, backbend, strengthening back muscles. The last two instalments of this series have concentrated more heavily on what happens at the northern end of the spine when posture goes awry. Today we move to an issue that affects more than one third of women in the US, and contributes heavily to the burden of disease globally. It is the issue of pelvic floor disorders and it has some very real postural links. While it is possible for men to experience pelvic floor dysfunction, it is an issue that is often thought of as a women’s problem because the burden of pregnancy and childbirth can contribute heavily to pelvic floor problems. Such problems can include bladder or bowel control problems as well as pelvic organ prolapse. It has been reported that more than one third of US women have a pelvic floor disorder and nearly one-quarter of them have symptoms [1, 2]. Commonly, treatment options are limited to biofeedback training, relaxation techniques, medication and surgery. But one does not have to look far to discover that posture and pelvic floor function are very much linked. A slumped posture (with thoracic kyphosis) increases downward pressure on the pelvic floor. Correct posture and spinal alignment improves the effectiveness of strengthening exercises. Correct posture promotes deep abdominal activity and enhances diaphragmatic breathing, which can enhance pelvic floor muscle activity. In 2017, Zhoolideh et al published a paper titled “Are there any relations between posture and pelvic floor disorders? A literature review.” It was a review spanning four major journal databases that offered up 22 relevant studies in order to examine any potential postural, bony or muscular changes in patients with pelvic floor disorders. The results showed “increased thoracic kyphosis, decreased lumbar lordosis, wider transverse pelvic inlet and outlet, increased contraction of pelvic floor muscles with ankle in dorsiflexion, increasing protrusion in shoulders and decreasing in the angle of head in patients with PFD’s compared to control group .” The authors remarked that this was true for different research papers with different methodologies. Whilst the authors were looking at global posture changes, and even looking into bony structures vs. soft tissue as well as flat feet, it is interesting to note that the spinal curve was highlighted as an issue for attention. “With regard to the role of intra-abdominal pressure in causing POP [pelvic organ prolapse], it should be noted that changing [sic] in normal spinal curves might cause extra intra-abdominal pressure on to the pelvic floor. Anatomic studies showed a role of normal spinal curvatures in supporting pelvic floor from direct intra-abdominal pressures,” remarked Zhoolideh et al. 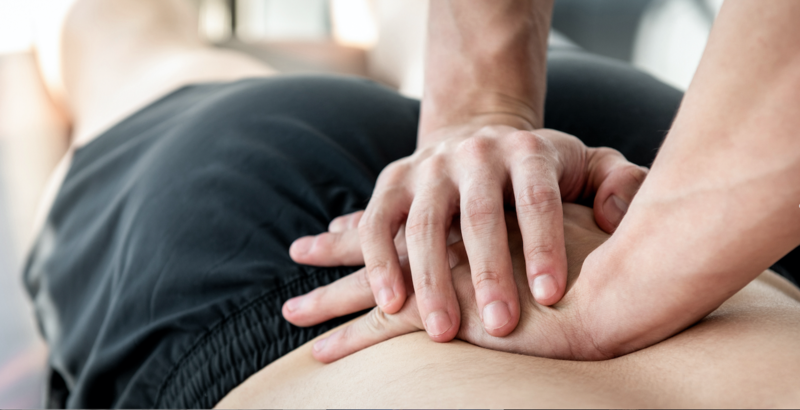 They went on to state that the normal forward and backward curves of the lumbar and thoracic region “might help in supporting abdominal viscera and absorbing downward intra-abdominal pressure” before it reaches the pelvic region. Interestingly, there is research that shows significant increases in intravaginal pressure in a hypolordotic posture (while standing) in comparison to a hyperlordotic posture . Typically, an EMG reading will reveal increased pelvic floor muscle activity during standing in comparison to lying. But we can now see (from Capson et al’s work) that hypolordotic posture may contribute to pelvic floor dysfunction. It is becoming increasingly clear that the lumbar curve is important in maintaining pelvic floor health, as is movement of the ribs in respiration. Therefore the thoracic/cervical curve is also important. It’s also interesting to note that the Herman Wallace Pelvic Rehabilitation Institute indicates that the goal of therapy may either be to increase or decrease muscle activity and function . This is where we need to take a look to our own professions research. In 2016, a ground-breaking study was published in the Journal of Manipulative and Physiological Therapeutics. It revealed that adjusting pregnant women appeared to relax the pelvic floor muscles at rest, an issue important for childbirth . A novel finding of the study was that participants in the control group, made up of non-pregnant chiropractic students who were adjusted often, were able to contract their pelvic floor muscles to a degree previously seen only in elite athletes. The implications of this study are yet to be fully researched and understood, but it does show us that there could quite possibly be a link between a subluxation-free spine and greater pelvic floor control. In light of the Herman and Wallace Institute’s suggestion that either a decrease or an increase in pelvic muscle activity may be the therapeutic goal (depending on the case), this piece of research is interesting. In the control group, their ability to contract their pelvic floor muscles was near elite athlete level. In the intervention group (pregnant women) their ability to relax their pelvic floor muscles was greater. We don’t know why yet. More study is needed to ascertain that. We just know that chiropractic care made a difference for the pregnant women in the study, but that there was a fascinatingly high level of pelvic floor control in the non-pregnant chiropractic students who were adjusted often. What we do know from other studies, however, is that chiropractic care can increase the brains ability to drive the muscles, and can increase the speed at which brain and body communicate with eachother. Time will tell exactly what this means therapeutically. In the meantime, we know that posture matters and chiropractic care may indeed have a role. This is encouraging knowledge indeed. Lawrence, J. M., Lukacz, E. S., Nager, C. W., Hsu, J. W., & Luber, K. M. (2008). Prevalence and co-occurrence of pelvic floor disorders in community-dwelling women. Obstetrics & Gynecology, 111(3), 678-685.